Debris released by human activity on land can be washed by surface runoff or blown by wind into rivers and other watercourses and ultimately be transported into the ocean. Debris can also be directly dumped or discharged from boats or sewage plants into rivers (Rech et al., 2014). Plastic is very efficiently transported downstream due to its near-neutral buoyancy and may reach the ocean after only a few days (Kabat et al., 2012). Rivers transport plastic debris and, because the average journey is much shorter than the time needed for plastic to degrade, the majority ultimately reaches the ocean. Debris can also become stranded on riverbanks or entangled in vegetation; it may then be remobilized by wind or surface runoff to continue its journey downstream (Williams and Simmons, 1997). 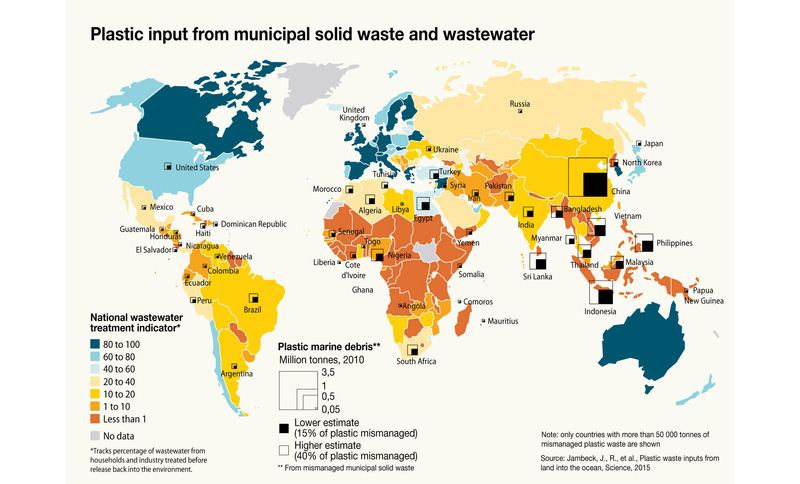 During high discharge events caused by heavy rainfall or human-controlled water releases, plastic and other debris can be exported far offshore from the river mouth. Dispersal of debris is also more efficient along coasts that experience high wave energy and/or large tides or other dynamic current regimes (Galgani et al., 2000; Carson et al., 2013; Lechner et al., 2014; Rech et al., 2014).